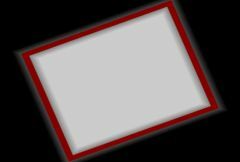 The rotation angle of the rectangle in degrees. The location of the rectangle center in screen coordinates relative to the center of the frame. This parameter can be set by enabling and moving the Center Widget. Note that moving the rectangle center can also cause the rectangle size to change so that the current value of Wipe Amt remains correct.